[AUTO](VC/RC): When this unit attacks a vanguard, choose another of your «Great Nature» rear-guards, and you may have that unit get [Power]+4000 until end of turn. If you do, at the beginning of your end phase, retire that unit. I don’t think anyone ran this. 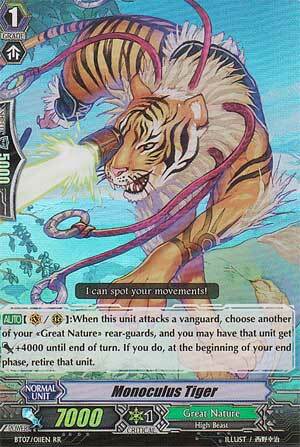 Binoculus Tiger and Leo-pald existed alongside this and actually was meant to be attacking from the start, unlike this BOOSTER.